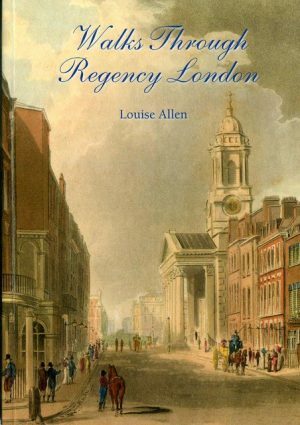 These ten walks are illustrated with photographs and original Regency prints from my collection and include: a walk through the City of London taking in no fewer than three notorious prisons on the way; an excursion south of the river to Southwark for a gruesome operating theatre and the only old coaching inn left in London and a stroll through the scandalous and fashionable St James’s area passing the site of Almack’s and the burial place of Beau Brummell’s grandparents. This book is the result of many explorations in search of the Regency London that forms the background of my novels. London has a long history and fire, war and redevelopment have destroyed, changed and blurred the physical evidence of that past. Yet it can still be found, sometimes intact, sometimes only as a ghost. These walks will take you to the London of the “long Regency” – the last years of the 18th century and into the first quarter of the 19th century. In some places you can see actual buildings and places that Nelson or Beau Brummell would have recognised. In others the explorer must use their imagination to conjure up the past. Following these trails will take you close to many of the great sights of London from all periods: they have not been mentioned here in order to keep the focus on the late Georgian period, but a little planning with a standard guidebook will help the reader to adapt these walks. Each walk is around 2 miles long, not allowing for visits inside museums, but they can be subdivided and tackled in shorter visits or linked together for all-day explorations.